Chancellor Howard Gillman, right, and Vice Chancellor of University Advancement Gregory Leet, center, recognize Henry Samueli and his wife, Susan, (not pictured) for transformational philanthropy. If you want to grow, you need to build upon a sturdy foundation. 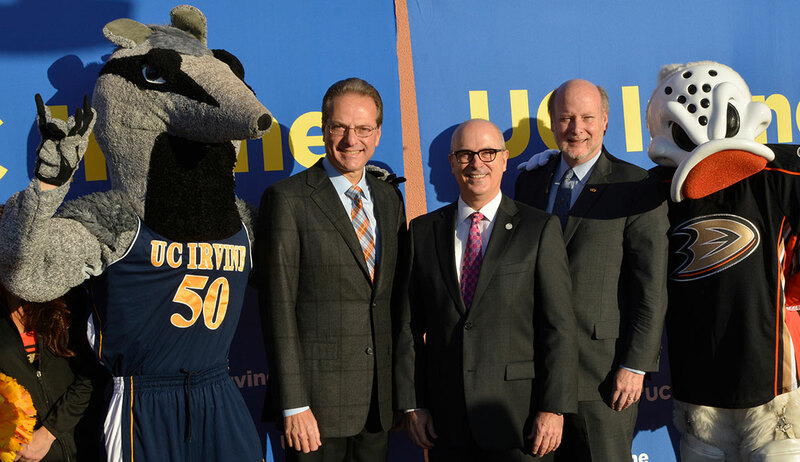 That was the message Chancellor Howard Gillman delivered to a crowd of more than 200 supporters about the crucial role they play in fostering UCI’s future success in research and education. At the inaugural Volunteer Leadership Summit, held at Anaheim Honda Center on November 21, the chancellor stressed the importance of developing community-focused programs in order to grow as an anchoring institution in the region. Chancellor Gillman and Gregory Leet, vice chancellor of university advancement, highlighted the impact of transformational philanthropy by recognizing Henry Samueli and his wife, Susan. After building his career as co-founder of Broadcom and owner of the Anaheim Ducks, Samueli invested his time, talents and funds in UCI’s engineering school, which was later named in his honor. His wife established UCI’s Susan Samueli Center for Integrative Medicine, where faculty members research the benefits of holistic healthcare. The two also have funded several graduate fellowships, chairs, professorships, programs and undergraduate scholarships.